In the Mid-1950's, CGC's Jim Balderson became the "8th & I Uniform Model." Originally assigned as a Pfc. to the Third Plt., his ceremonial demeanor and bearing soon caused Capt. Bob Lyons to name him as the CGC Guidon bearer and promote him to Corporal. 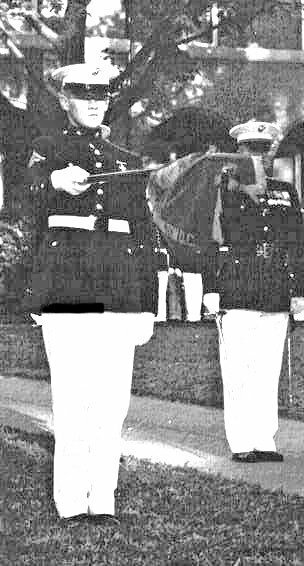 He is shown here in a 1957 Friday Parade. As Col. Chapman was settling into his new duties as Barracks CO, he noticed the "saltiness" of the ceremonial troops - the grommets in their "gourds" bent down in front and expanded so as to have a "saddle" in them, and wearing the trousers so short that the cuffs were above the tops of the shoes (this saved a lot of time from removing dark shoe polish from the legs of the trousers). Col. Chapman, ever inventive and a true believer in killing multiple ducks with one stone, saw an opportunity: first, the Barracks was due to supply the Guidebook for Marines with update materials on uniforms and proper wearing of equipment; and second, to cure the "saltiness" around the Barracks. The first opportunity was supplying photos of 1st Lt. Frank H. Mitchell (plt. leader of the Third Plt.) 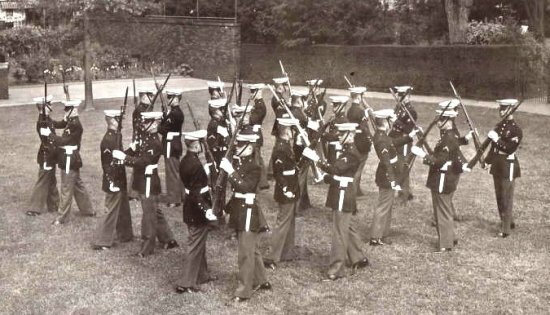 showing proper execution of the sword manual; and the following photos of Cpl. Balderson in "non-salty" appearance with loosened grommets in the gourd and trousers cut to the top oF the heels, with a 1/4" break over the shoe laces. Apart from the copies distributed at HQMC, these photos were pasted all over the Barracks with dire warnings to befall those found not in compliance. Col. Chapman appeared "under the arcade" at a surprise inspection of the troops as they were about to "march on" for a Friday Evening Parade. There was much audible rustling of equipment to meet the new requirements, and as soon as each platoon had been inspected, as Col. Chapman passed on to the next, his movements were accompanied by barely audible giggling and the sounds of rearrangements of trousers and grommets and "gourds" being to their previously "salty" configurations. The troops had prevailed, and the subject was not raised again.